Richard B. Richardson Jr. of Houston blew away a 1988 state record when he caught a 972.72 pound blue marlin from the Gulf of Mexico fishing out of Port Aransas. The huge fish measured 132.25 inches. 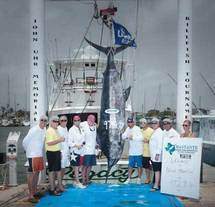 Richardson in red cap, just left of the fish, was fishing in the Bastante John Uhr Memorial Billfish Tournament as a member of the eight-person Legacy Fishing Team.